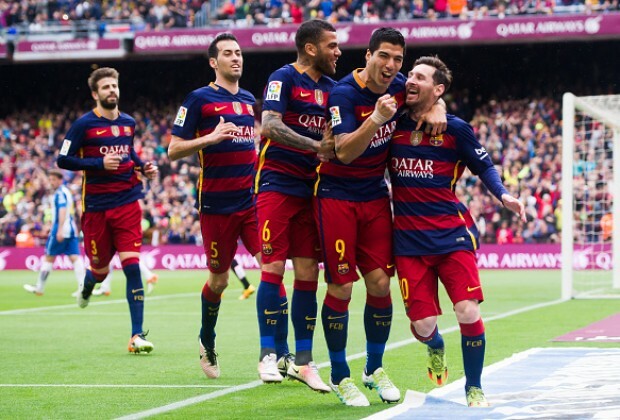 FC Barcelona moved one step closer to clinching the La Liga title, after they thumped Espanyol 5-0 at the Camp Nou. The hosts took the lead after just eight played minutes later, as Lionel Messi netted his 26th league goal with a fine free-kick from the edge of the area. Barcelona had the ball in the back of the net again a few minutes later, but Ivan Rakitic's close range strike was flagged for offside. Luis Enrique's charges continued to dominate and they were presented with a chance to double the lead in the 23rd minute, but Messi scuffed his shot in the box. Despite having a lion-share of the possession, the score remained 1-0 as the sides entered the halftime break. The hosts then doubled their lead in the 52nd minute, as Luis Suarez latched onto a pass from Messi, before clinically firing past Pau, 2-0. Suarez did not have to wait long to get his second, as the Uruguayan got on the end of Neymar's cross and powered home a header from the center of the box, 3-0. The league leaders grabbed the fourth goal in the 74th minute, as substitute Rafinha tapped home from close range, after poor error from Pau.